I’m an academic in a wheelchair – why is it so difficult? If you’re a regular reader of my blog and have just thought “Wow – surely he can’t be in a wheelchair, because he’s a good programmer, and a (moderately successful) academic!” then please read to the end of this blog, and ideally some of the rest of the BADD posts! I’m not going to go into all of the medical stuff here, but basically I can walk a bit (upto about 100-150m), but anything more than that will utterly exhaust me. This situation is not ideal, it has only happened in the last six months to a year or so, and it has taken me a while to adjust emotionally to “being disabled”, but – and this is the important thing – a wheelchair is, for me, a huge enabler. It gives me freedom, rather than restricting me. My wheelchair doesn’t restrict me doing many things by its very nature (and in fact I can do many things that non-wheelchair-users can’t do, like carry very heavy loads, hold a baby on my lap while walking, and travel 10 miles at 4mph consistently) – but the design of the environments that I need to use on a day-to-day basis do restrict what I can do, as do the structure of the systems that I have to work within, and the opinions of some people. I’m going to talk about things that are particularly related to my field of work: academia. I really don’t know how to organise this post, so I think I will just post a bulleted list of experiences, thoughts, observations etc. I’m trying not to ‘moan’ too much, but some of these experiences have really shocked me. One other thing to bear in mind here is that many of these things are just because people “don’t think”, not necessarily because they are deliberately being “anti-disabled people” – but in the end, the practical issues that result affect me the same amount regardless of the reason behind them. I was informed by the university insurance office that when travelling to a conference the university insurance would cover my electric wheelchair, but I would be required to cover the excess of £1500 if there was a claim. This was because it was a “personal item” and therefore treated the same as any other expensive personal item, such as a diamond ring. I’ve now managed to sort this – and there should be a new university-wide policy coming out soon – but sorting it required pestering HR, the Equality & Diversity team, the Insurance Office and my Faculty. Surely someone had travelled with a wheelchair before?! I went to an Equality & Diversity event at the university with various panel discussions that didn’t touch on disability as an Equality/Diversity issue at all – the focus was entirely on gender, race and sexuality. I’m aware that there are probably more women in the university than disabled people (! ), but actually if you take into account the statistics of the number of people who are disabled in some way then it must affect a large proportion of staff! It took me about ten minutes to get, in my wheelchair, from the main conference room to the disabled toilet, and this involved going through four sets of doors. One of these doors was locked (and required a code to open), and I was originally told that I’d need to find a security guard to ask to open this door every time I wanted to go to the toilet! Umm…as an adult I’d rather not have to ‘ask permission’ to go to the toilet…so luckily my wife memorised the code! There were multiple times when other doors along the route were locked too. I felt like a second-class citizen just for wanting to go to the toilet! After the conference dinner one evening I was told that there was “no step-free way for me to leave the venue”. I was somewhat confused by this, as I had entered the venue without using any steps…but it turned out that the main entrance gates were locked and “they couldn’t find the key”. After disappearing for ten minutes to try and find a key, their suggested solution was to carry me down some stairs and out of another exit. The lifts in many university buildings are barely large enough to fit my (relatively small) wheelchair, meaning I have often got stuck half-in a lift…not a fun experience! There are other wonderful things about many university buildings and environments, including entrance ramps to buildings that are located at the bottom of a flight of stairs (why?! ), disabled toilets that are only accessible through very heavy doors (almost impossible to push in a wheelchair), and the fact that the majority of the lecture theatres are not accessible for me as a lecturer! It is often assumed that, as someone in a wheelchair, you must be a) a student, and b) need help. I’ve been stopped by people many times on campus and asked if I need directions, or help getting somewhere – despite the fact that I’ve been working on that campus for nearly 10 years now, and I don’t look much like a student. I don’t mind people offering to help (far from it) – but it shows an in-built assumption that I can’t be a staff member, I can’t know what I’m doing, and I must be a ‘helpless person’. The hotel that booked an “adapted room” for me, except that I didn’t actually get given an adapted room because “they were all in use” (surely they knew that when booking me?!). They did manage to provide a stool for the shower, and the room was large enough to get my wheelchair into – but why on earth did this happen? After spending four months going through the Access to Work scheme to try and get an electric wheelchair which I need for work (and which I was assessed as needing for work), I was rejected and told that I didn’t need it and wouldn’t be funded it. 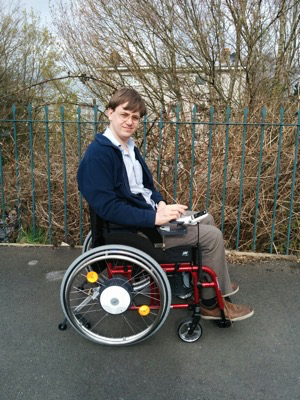 It’s called Access to Work and I needed my wheelchair to access work – it’s not that difficult (luckily my family offered to fund my wheelchair). I know the answer to this (it’s about government cuts), but I’m not going to go into a rant about the government here! The university has a lot of support for disabled students (with a whole disability service, Disabled Students Allowance, the Counselling Service and so on), but nothing like that to help staff. Everything just takes a huge amount longer, and none of the systems are designed to work well for people with disabilities. This ranges from travelling around the building (the lift in my building is hidden in the far corner and it takes a long time to wiggle around the corridors to get there), to booking events (most people just book a flight online: I have to have a half an hour phone call with the airline giving them pages of information on my wheelchair battery) to doing risk assessments (don’t get me started…). For someone who is working part-time anyway, this takes up a huge proportion of my time! The combination of these examples – and many more that I can’t think of right now – is that I often feel like a second-class citizen, in academia, on campus, when travelling and so on. This isn’t right – but the silly thing is that it doesn’t take that much effort to change. Many of the examples given above could have been changed without much effort or much expenditure. Most of them are really simple: just don’t say anti-disability things, if you promise to do something then do it, add some chairs, prop the door open (or officially give me the code), don’t lie about the accessibility of your building, and so on. It’s not that hard! Anyway, I’d like to end on a positive note, with an example of a conference that is doing pretty-much everything it can to be accessible and inclusive. It’s not actually an academic conference, it’s PyConUK 2016 – a conference on the Python programming language. When I read their diversity, accessibility and inclusion page I actually cried. The headline on that page says “You are a first-class citizen of our community”, and then goes on to discuss what they have done in detail. I’ll let you read the page for the details, but basically they offer financial assistance, a free creche, a quiet room to relax away from the conference, step-free access, BSL interpreters, speech-to-text translation, and more. I’ve spoken to the organisers and thanked them for this, and after the conference I’m intending to ask them how much extra this inclusion work has added to their budget…and I suspect the answer will be “very little”, but it will make such a huge difference to me and to many others. Thanks so much for taking part in BADD! It was really good to read your experiences and it’s so nice to hear about PyConUK getting it absolutely right on so many levels. We are in the UK? In the 21st Century? Sometimes, I read/see/hear things about what people with disabilities – I count myself in that group – have to go through, just to get an even slice of the pie. Great post and totally in keeping with BADD! A bit of similar perspective from the states http://speedchange.blogspot.com/2010/03/constructing-disability-second-class.html and welcome to BADD. Interesting, lot of overlap with my piece – On ‘Giving Up’. I just flagged that PyCon page on the Fans for Accessible Conventions FB page because of the way it goes out of its way to say ‘we need you here’. Thank you for commenting. I wasn’t actually planning to write anything for BADD (it was a bigger deal than I thought it would be to “come out” as disabled on my blog), but I felt inspired to write something after reading your post…so thank you! And thanks for the pointer to the FB group – I’ve just joined. I envy you for having an on-campus role. Remote Desktop and email allow me to continue my academic work, which makes life worth living. It is sad that all this is so in a relatively enlightened establishment such as a university. There is a very real sense in which organisational issues can double a disability. From my own experience in a different issue the only way forward is to take on further effort still in constantly reminding key people that this shouldn’t be happening,and to make small specific but I incremental demands. Should you have to do this?No. But what is the more empowering option in the longer run? Thank you for writing this important blog. Thanks Robin. As someone who organises conferences, it’s really helpful to know the things which affect people in the ways you’ve mentioned – whether it ruins someone’s day, treats them as 2nd class, or makes it impossible to take part. Last year I organised a conference and was assured by the venue that it was “fully accessible”; arrived and found there was a bloomin’ step in front of the main entrance. Failed at (literally) the first hurdle. Sadly, some people just don’t think beyond their own needs – “I didn’t have any problems getting in or moving around, so it must be fine”. Hope things get better, and I’d be really interested to learn more about how to make events accessible. Have liked the page mentioned above. I won’t comment on University buildings cos I’ll only end up being unforgivably rude. I like to remind HEIs that the legal requirements to consider accessibility actually started in *1975* not always 2005 like they often think. Sadly UK Equalities law is a barely enforceable piece of nonsense. Equality and Diversity at Universities often only seems to cover “women” cos at the higher echelons it’s still often an Old Boy Network and women who reach that high are excluded and treated like crap. Deities help them if they got a disabled, BME or trans person – they might actually implode. They haven’t heard of intersectionality and that anyone can become disabled at any time and that indeed it’s not a hierarchy as no one ever goes back for those left behind. I do like that PyCon accessibility statement, the positive, unashamed affirmation of citizenhood is really lovely and not said often enough. I like that they offer ideas of what they can do AND invite requests – best of all worlds. Some of the best adjustments (accessibilities) are attitudinal and don’t cost anything except a bit of information, time or thought. Hope the number of fails reduces over time and you work out who is trustworthy and who isn’t even if it’s your time spend chasing the untrustworthy ones. I think I would have lost my temper in several of those instances you describe… I’ve now got very limited tolerances, I now complain vociferously about fail and expect resolutions or else. Asking nicely doesn’t work. Hi again Robin, I’m enjoying our conversation on Hotmail (that arose from my last comment here on BADD) and on academic email. Now I’m looking at how you’ve so many people’s comments on BADD 2016 whereas my own article here this year (This wheelchair user has a voice) got only one comment. Why? Nothing wrong with my article. Obvs your article’s great too. Most of the people who wanted to comment on my article had already done so in a filtered thread on LiveJournal. Next year for my BADD 2017 article I’ll want commenting to be possible from anybody who’s online. How should I make it accessible in that way? Would google+ help? Lying about accessibility is a common thing here in Edinburgh. They are scared they will get in trouble if they confess something is not accessible, so instead they make up ways and reasons that the access problem isn’t really there. Such as promising that an unqualified, uninsured person will lift you, and out comes a 75 year old bloke. I’m not prepared to be lifted by anyone, ever, but more so I am not prepared to be lifted in my chair as it’s not rated for that, it’s for sitting in. Stresses and forces will go in different places if you try to lift it up. Lack of access as a lecturer is a familiar concept for me, as I work for a music organisation. We are forever contacting people for access and they go on about the access they have for audience members for ages before we can stop them and say that our wheelchair users want to be on the STAGE! This is a novel concept. Yes, we can watch, but we can’t perform. Disabled people are passive recipients, never active givers. Grrr. Interesting, though disheartening, to see the same at work in other contexts. Hi! I’m not sure why I got more comments – I very much enjoyed your blog post. I didn’t do any particular ‘advertising’ of it, although I saw it got posted on Twitter by the BADD people, and I posted it on my Facebook account. I guess the only other thing is that some of my ‘regular’ blog readers (on the technical/academic topics that I usually blog about) may have read it and commented. I’ve never used Google+ myself, but it might have an impact…not sure! I’m actually part of the support staff in a different (I think? 🙂 uni, and a lot of what you say seems creepily familiar. At a guess, your institution was built in the 60s, on the cheap, like mine? They pretty much shoved it into a hillside that used to be a bit of arable farmland (though given the drainage issues I expect mainly used for grazing) and just arranged the floor levels “however”, with innumerate small rises and half-flights of steps all over the place. If they had considered the needs of anyone with mobility problems to access the place for even a few seconds, then what they must have concluded was “eh, they can go out and around the car park then back in”… not counting the upper floors of the halls of residence, there aren’t any levels of the original layout that can’t be reached at all from outside step-free, but doing so may involve a very, very long bit of wheeling around the outer perimeter, including up or down steep gradients, and in all weathers. The various administrations down the years have tried to improve on this, especially when building new extensions (the main “new” block up until a few years ago was the only one with a proper built-in lift and consistent altitudes across each entire floor; another larger one has been built since with much better access and reasonable step-free integration with the various adjoining levels, including at least token attempts to fit automatic doors), but retrofitting such stuff into a dashed-off redbrick poly from the 60s is the devil’s own work. Whilst is it now technically possible to hit all but a half dozen lesser-used rooms across the whole campus without having to go outside, even if a bit slowly by using some creaky bodged-in lifts and stair-elevator affairs, it does rather hinge on them actually working. Which, often as not, they don’t. Some are more reliable than others, but none are entirely 100%, and one particular black sheep (daring to wear the Stannah logo, even! )… well, I make a habit of testing it myself every now and then, and over the past 3-4 years I’ve found it in working condition maybe twice. Out of order many times more. Despite repeat engineer visits. I figure it’s just a badly designed machine, but it’s the only one they could find that would serve that particular purpose. The fun thing with that one is that it’s the latter part of a two-stage run any impaired-mobility lecturer would have to embark on in order to present in what is still our main lecture theatre, entering via the “side door” (actually a long and dingy fire escape corridor, itself only having been added in the last 10 years as a keep-clear thruway instead of everyone having to clamber through the backstage area). If that’s not available, then it’s back to the outdoor assault course. And then there’s the other stuff. The lack of joined up thinking, the obstructive security routines (in case of that lecture theatre, the lower doors are routinely locked around 5-6pm – only openable by pushing the fire-escape bar on the other side – so good luck if you turn up at 5.15 to give a talk in there at 5.45… though once you’ve got those opened they can at least be wedged and the only nearby accessible toilet is, luckily, on that same level; bear in mind this is also looked after by the same staff who generally can’t be arsed with properly unlocking the fire doors at the upper end pretty much ever, so people keep banging into the one still-locked side of a pair of double doors… in an actual fire, it’d be carnage), the focus on student support with very little staff support unless you go there and ask your colleagues if they would mind giving you some of their time (this is thankfully slowly changing, at an institutional / cultural level, but it IS slow, and there’s still no real “staff support centre” or the like here like there is for the students… it all has to go externally, through Capita and suchlike, as I myself found when needing to access it in a fairly urgent manner), poor communications, jobsworthiness (the amount of browbeating you have to go through at multiple levels and departments in order to get hearing aid induction loops fitted, whilst all the time they’re debating the need for them, as if their being listed as a requirement for lecture halls in the DDA isn’t reason enough, FFS…), the crazy long diversions you have to take even when there is an indoor step free route (I’m not in a wheelchair, but I – along with e.g. the catering and reprographics staff – often have to move heavy, wheeled items around, and have previously had to assist wheeled visitors in finding their way between places) on top of waiting for the sloooowwww hydraulic bodge-lift to do its job… and of course the endemic patronisation… (remember folks: see the person). Oh, and, thanks to some personal issues on the mental health and learning abilities side that have only really been fully revealed, investigated, and – at last – started to be nominally helped in the last couple years, all the fun of trying to access those services, including having to apply through Access To Work for funding for them (nevermind that really, if I’d known what the actual bill would be in the end, I could have and would have happily just covered it out of my own pocket in order to speed things up), a fun little game devised by the DWP which I’m still having to occasionally participate in. This week’s task is trying to get back in contact with a chap from ATW called Alistair who called me on my mobile a couple weeks ago, left an answerphone message with his number, asking me to call him back, without saying what about or what times he’d be available… ever since then, any time I’ve tried calling that number, it’s just rung out. I’ve left it for several minutes sometimes, and eventually the line just cuts off. I’m not sure he actually exists, even, given that his STD is for Halifax, and apparently ATW haven’t operated out of there for about a year now. Maybe he’s moved to Glasgow but keeps forgetting to give the new number? I’ve now found someone else with an atw.dwp.gsi.gov.uk type email address and a matching dialling code and exchange, listed on a website somewhere, so if I can’t raise him tomorrow, then I’m going to try calling them and – should they pick up – ask if they could either put me through to him, or to their switchboard. Lest I spend one of my upcoming days off driving the 150ish miles up the M42 and M1 to knock on their door in person. Name withheld for obvious reasons! You already change the life of your students I think You already made your mark. Forget about such things You are special in God’s eyes.